One should send the arrows of love into the friend’s heart in his inner intentions. On the outside he should show everyone how inspired he is by spirituality and try to motivate the friends to feel the same. But internally a person should always think about how he can penetrate the friend’s heart. Corporeal gifts won’t hurt, but they mustn’t replace one’s inner efforts and his true desire to connect. After all, our work is in awakening the inner forces within, the net of forces or the scope of a single force of the Creator. This is the force we connect to in order to penetrate all the hearts and souls. External gifts can help in our work, but the main goal is to try to tune into this connective system which binds us with one another. In it we reveal our connection and penetrate it. This is called penetrating the heart of the friend. The deeper I wish to penetrate into the heart of the friend, the more I melt away my own heart. As my heart becomes softer, I begin to see that the friend’s heart is becoming more and more revealed and I’m able to enter it and unite into a single heart. And in the end of this work, I reveal that neither my heart nor his heart exists, that there is only one heart and one desire, and that it has always been this way. It only seemed to me that these were separate hearts, hearts that were strange and different, distant from each other. There Should Be No Downfalls! Question: How, after the convention is over, can we keep ourselves in the state that we achieved there? After all, there usually comes a downfall? Answer: We cannot afford it, similarly to how a mother who has a little baby on her hands cannot show that she is sick. There are situations when necessity puts everything else in the background. And only if a mother is on her deathbed does someone else take care of a baby. In our case, we don’t have time for rest, lofty phrases, and downfalls. The world around us is developing very quickly, while we lag behind and thus must get abreast of its speed. We will feel more and more how all bad things happening in the world are related to us since we are late with our correction. This is why I don’t even let the thoughts about a post-convention downfall cross my mind: It just can’t happen! Besides, until the summer our schedule is packed with important events: conventions in Italy, Spain, and Moscow. We all have to unite and prepare for them. This is why we don’t have any breaks, everything is compressed in time. And this is good because it corresponds to the speed of changes taking place in the world. People view Passover as the holiday of the historical exodus from Egypt. “We used to be slaves and we built several cities and pyramids for Pharaoh, and then we came out to freedom.” However, in realty we are not celebrating a date in the historical calendar. After all, the situation today is much worse than back then. It’s enough to compare the situation of the nation of Israel in Ancient Egypt with the current situation and you would be running back to kiss Pharaoh’s hands, begging him to let you back. The Jews lived in the land of Goshen, which was the most favorable part of Egypt with the most fertile soil and abundant herds. You could do whatever you want because Pharaoh doesn’t just rule there but he protects you as well. No one can touch a hair on your head, your vats are full of meat, your nets—full of fish, and your storehouses are full of produce. You are a slave only because you have to listen to Pharaoh. This means: Act by the orders of your egoism, and nothing more than that. So what do we remind ourselves of on this holiday? Were we surrounded by enemies back then the way we are today? On the contrary, we had all the favors at our disposal and Pharaoh’s power protected us from enemies. In his country he allowed us to live however we wanted, even on separate territory and by our own laws. So what’s so bad about that compared to the current situation? When you desire precisely this, then Egypt will seem like exile to you. This is the only thing missing here—love for the neighbor. Thus, it turns out that we celebrate Passover to commemorate the good life in Egypt and not the redemption, which no one really needs. After all, coming out of Egypt means throwing away everything we have besides love. This is talking about freedom from egoism, when egoism has everything, yet I want to run away from this. I hate this abundance and I don’t desire it. I don’t need the filling food, nor the safety, nor the comfort, nor the health—nothing. I am ready to drown in the waters of the Marginal Sea or to dry up from thirst in the desert—anything to break out of the bonds. Through the engagement in Kabbalah with the intention to reach the property of bestowal, there manifests the natural remedy of Kabbalah study, as it is said: “The Creator says, ‘I have created the evil inclination, I have created for it the Torah as a spice.’” Thus, that person develops and marches upward in degrees of the above spoken exaltedness, until he loses all remnants of self-love and he performs all his actions only to bestow, so even the necessity that he receives flows in the direction of bestowal. Question: What should I do if I am not Jewish and I don’t celebrate Passover? Answer: Go ahead, celebrate it—what’s the problem? Why can’t you be related to it? After all, you belong to “Israel,” the desire that aspires straight to the Creator (Yashar-El). Besides, you can celebrate this holiday in honor of the fact that there used to be a group of Kabbalists that went through the entire path of corrections and then broke up in order to help us re-ascend again today. By celebrating Passover, we associate ourselves with this group: not with a nation, but namely with a group of Kabbalists. Every person wishing to climb out of the current state into the spiritual world has to respect and value this group, which has gone through the path and written books with instructions for us that we can use to advance forward as well. We celebrate and honor our teachers, without any connection to national belonging. We belong to this group and want to be related to it. Later, when we enter the spiritual world, we will discover that we are together with them, that our group does not only include the friends from the whole world, but also them. Mostly they are all the Kabbalists of all the generations who once turned away from Babylon in order to take the spiritual path. And we are in their group. Question: What is the meaning of the command, “Remember the day when we came out of Egypt” in the sense of a person’s inner work? Answer: It says in The Zohar, in Item 121 of Chapter "Bo" that the Torah will mention the exodus from Egypt 50 times. Besides that it is written that every day a person must see himself as coming out of Egypt, and that is because all of our work happens only in relation to Egypt. A person’s spiritual work on correcting his egoistic nature begins from the state of “Abraham”—the rudiment of the quality of bestowal. But how can we develop this quality? This is why “Abraham’s” question to the Creator emerges in a person: “How will my descendants inherit a great land?” (Chapter "Lech-Lecha"). This means: How can I develop inside of me (because my descendants are my future states) a huge desire of bestowal and love in order to receive Your entire Light from You? This receives the following answer (from the Creator to Abraham), “Know that your descendants will be in exile for 400 years,” where 400 years are all four levels of egoism. That is, the Creator tells a person that he will become entirely immersed in egoism and will thereby acquire a desire equal to the Light of Infinity. Everything revolves around “Egypt”: Part of our path is “before it” and part is “after it.” But Egypt is the central point. That is why a person must feel that he is coming out of Egypt every day, meaning that every day he takes a part of the egoistic desire and corrects it, and receives a new Light inside of it. This is called “a new day.” And this continues on all the levels. We are egoists and are only able to do whatever is important to our ego. How, then, can we get rid of it? 1. To move under blows from our nature, meaning to develop due to having no other choice until we will nevertheless desire to get rid of the suffering. However, the path of constantly running away from evil is very lengthy and diffcult. 2. To use the magnifying glass of the mind without waiting for the blows to come. In the article “The Essence of Religion and Its Purpose” Baal HaSulam explains that we can raise our perceptivity and keenly recognize the signs on the path, similar to being able to understand a word before it’s finished. A wise person sees things that others don’t even notice. Some people write down wise advice but don’t let it pass through their heart. There are all kinds of cases. Every person has his “fate.” To the extent that a person hears what he is being told, that is how much he will advance if he is ready to draw a distinction between his ego and the spiritual path, if he properly interprets the meaning of "exile" and "redemption" and is willing to be relentless and stubborn even though it’s unpleasant to his egoism. A person works in order to raise the importance of ascending above egoism, even though this causes him pain and seems like a loss. He discerns new things again and again, and with every new stroke the loss of egoism no longer seems sorrowful compared to the spiritual attainment that becomes revealed. And then he receives another addition of coal into the furnace of self-love, and that is in order to achieve the following ascent. The Book of Zohar, Chapter "Yitro (Jethro)," Item 533: There are two gemstones and one Masach between them, standing between each other. The upper gemstone is colorless, it is not openly visible. Item 534: Malchut is called “a gemstone” because it clings to NHY de ZA, which are called “legs.” Because of Malchut’s ascent to Bina, Bina, too, is called “a gemstone,” and it is an upper gemstone. There exists the ladder of the spiritual degrees extending from the world of Infinity to our world. This ladder consists of 125 rungs. The upper part of each degree contains the lower part of a higher degree, while the lower part of each degree is immersed in an even lower degree. 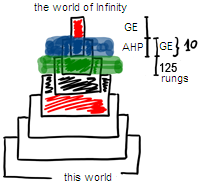 The upper part of the highest degree is the world of Infinity, while its lower part is inside the lower degree. It follows that the lower part of each higher degree exists together with the upper part of the lower degree. Hence, in each degree there is a common part between the upper and lower degrees where both of them unite into one. The upper part of each degree is called Galgalta ve Eynaim (GE), while its lower part AHP (Awzen-Hotem-Peh). In sum, they comprise 10 Sefirot, but in a way that the lower degree contains the AHP of the upper one, and the GE of the lower degree clothe this AHP. It follows that the upper part of each degree is comprised of 10 Sefirot in total, which the upper and the lower degrees form together. This is how it is at every degree. In the collective system of souls we are all connected together, all seven billion souls. Hence, all parts of my soul are included into everybody, and if I connect with them correctly, all of their parts are within me either as my GE or AHP. That is, nothing is left of me but my initial point with which I started my path. Only it remains in me; it is my foundation. I acquire everything else from the others: either the GE or AHP. I include everyone within myself: It is the body of my soul. 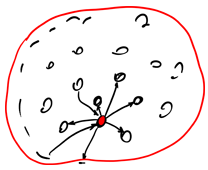 This is what The Zohar explains: It is impossible to create a "gemstone," Malchut, the spiritual vessel of each person unless he or she connects with everybody. I need everyone: They are my spiritual vessel. I have to receive my GE and AHP from everybody. And who am I? I’m the point in the heart from which I started the path.